Focusing foremost on relaxation, massage is a great way to relieve stress and anxiety. Let us relax and massage your body with a pleasing blend of our Eminence Organics Body Oil into a heavenly state of bliss. Aromatherapy utilizes naturally extracted aromatic essences from plants to balance, harmonize and promote the health of body, mind and spirit. Your aromatherapy massage includes a consultation and mixing of a personalized blend of essential oils to meet your specific therapeutic or relaxation needs. During your treatment this custom blend is used in the massage to transport you to a place of deep relaxation. Combines a firm touch with the gentleness of warm volcanic stones. The stones soothe muscles and expel tension from nerve endings. This long 60-minute massage induces a deep state of relaxation. 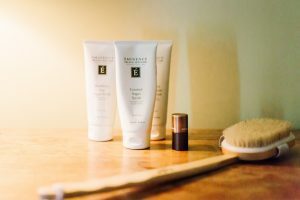 Start off your 60 minute massage with a complete body dry brush treatment followed by an application of our pleasing Eminence Organic Oils. Including a Soft Glowing Exfoliation Treatment and an added luxury of a light massage with our extra emollient Honeydew Body Lotion and Linden Calendula Treatment to protect the new layers of your baby soft skin. A truly gentle and nourishing way to care for your skin. Extreme sensory pleasures are derived from this refreshingly chilled masque and warming wrap. Beginning with a light scrub for receptivity, a cool blend of stonecrop, an exotic succulent historically used to increase the moisture content and health of all skin types is generously applied. Then a wrap of thermal blankets and hot towels is applied while your feet and scalp are treated to a warm oil massage. The uncommonly stimulating contrast of cool and warm is not only a delight to the senses but also exercises the skin on a cellular level. This body renewal is finished with a light massage of organic Citron Soufflé for a radiant replenished body. Our comforting body wrap features essential oil from Ginger, Cinnamon, and Lemon. Warming properties from Hungarian Herbal Mud and Paprika soothe tension on your back, neck, shoulders, legs and arms. While cocooned enjoy a face, scalp and foot massage allowing your wrap works its magic. Your treatment will conclude with a generous application of Cinnamon Paprika Body lotion that will leave you warm and glowing! Buff your skin to perfection with raw sugar & coconut oil, next our Mango Enzymatic Peel is layered on with Active enzymes & vitamins gently exfoliate and infuse hydration. A light massage with a blend of Honeydew and Apricot oils finishes your deeply relaxing treatment. Eminence organic oils are are used in the hair and scalp for luxurious nourishment. Enjoy a relaxing scalp massage while the oil revitalizes hair. A neck and shoulder massage completes this treatment.